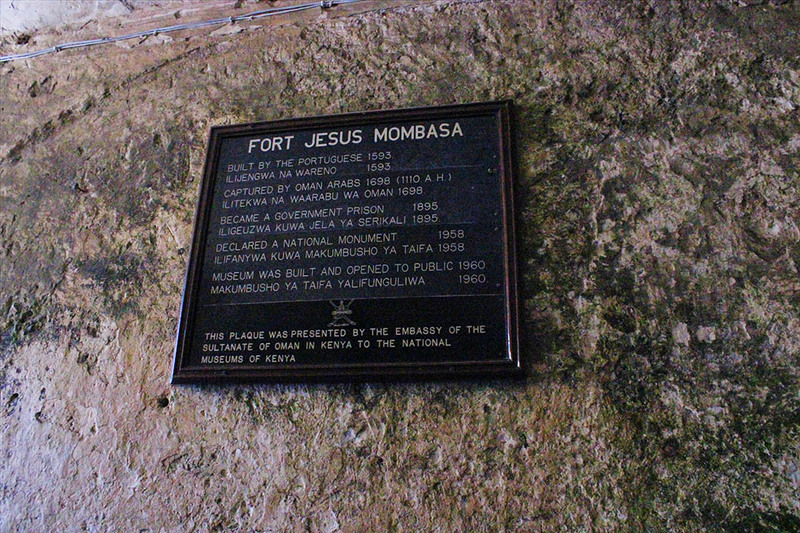 Fort Jesus is located at Mombasa on the Kenyan coast. It is one of the three outstanding early Portuguese forts built around the coast of Africa in the 16th century and now included on the world heritage list (others are at Mazagan, Morocco, and the Island of Mozambique). 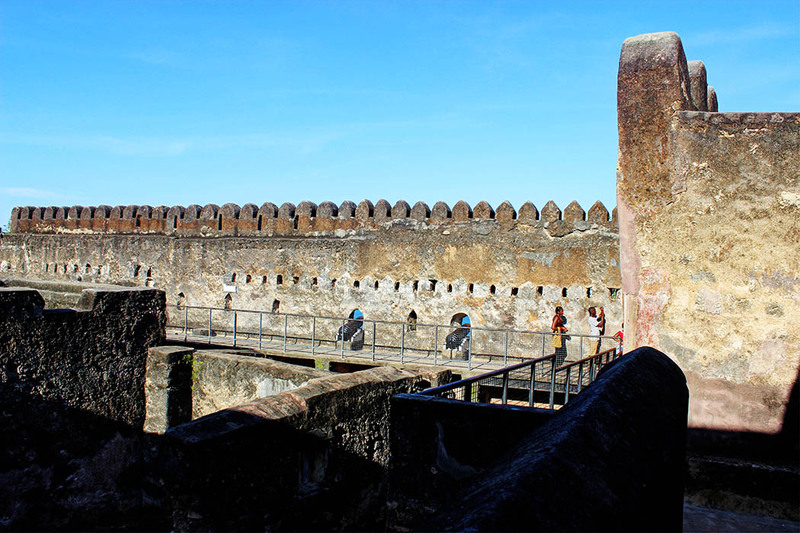 It was built between 1593 and 1596, and features high plastered walls built of coral rock, and a peculiar angular shape designed so that any assailant trying to climb any of the walls could easily come under fire from one of the bastions. On 11 April 1593 the fortress was dedicated and named “Fortaleza de Jesus de Mombaça” by Mateus de Mendes de Vasconcelos the then captain*. 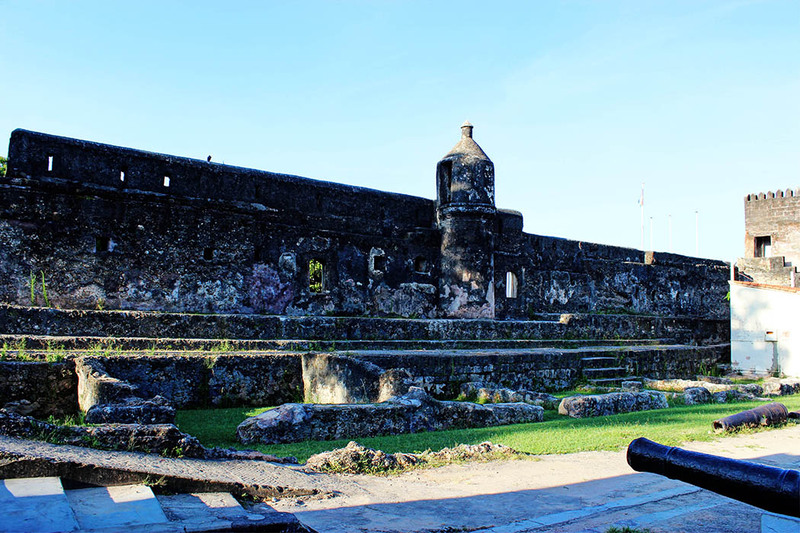 The fort was completed in 1596; the plan was a quadrilateral with four bastions: S. Felipe, S. Alberto, S. Mathias and S. Mateus. 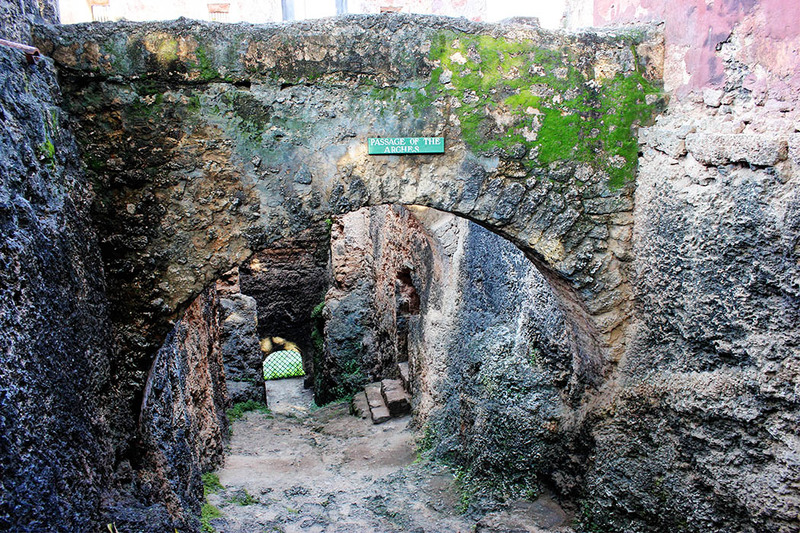 The main gate was near S. Mathias bastion. Seen from the air, the fort has the shape of a man lying on his back facing the Indian Ocean. 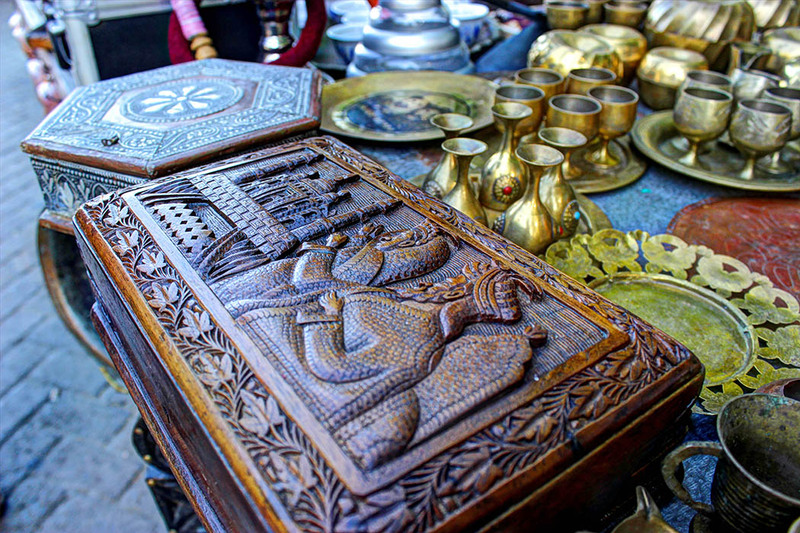 The fort has a rich history and has passed hands many times during its existence. 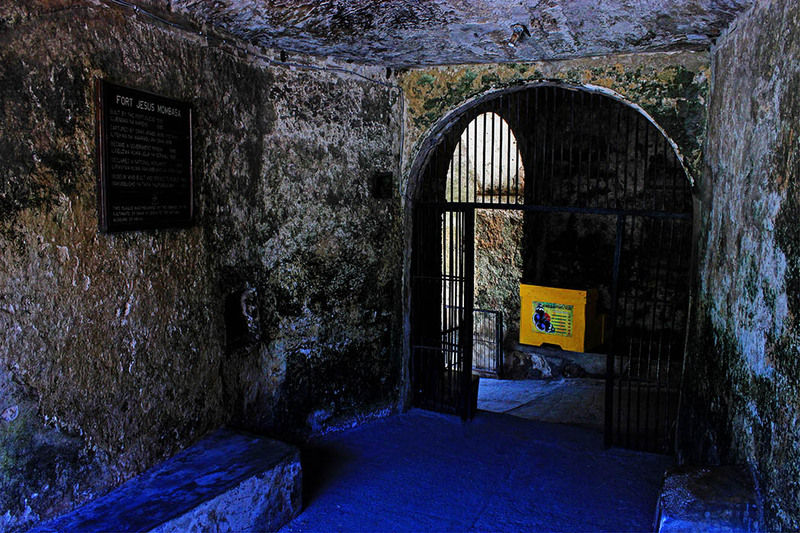 On 16 August 1631, the Sultan Dom Jeronimo Chingulia entered the fort and took the Portuguese by surprise; he killed the Portuguese captain, Pedro Leitão de Gamboa, and massacred the whole Portuguese population of Mombasa (45 men, 35 women and 70 children). 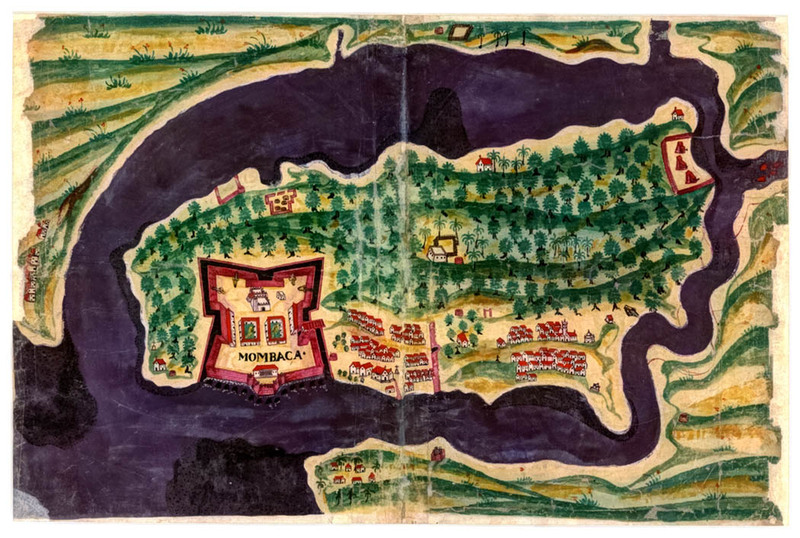 A Portuguese expedition was sent from Goa to retake the fort, but after two months of siege (10 January 1632 to 19 March 1632) they abandoned their mission. 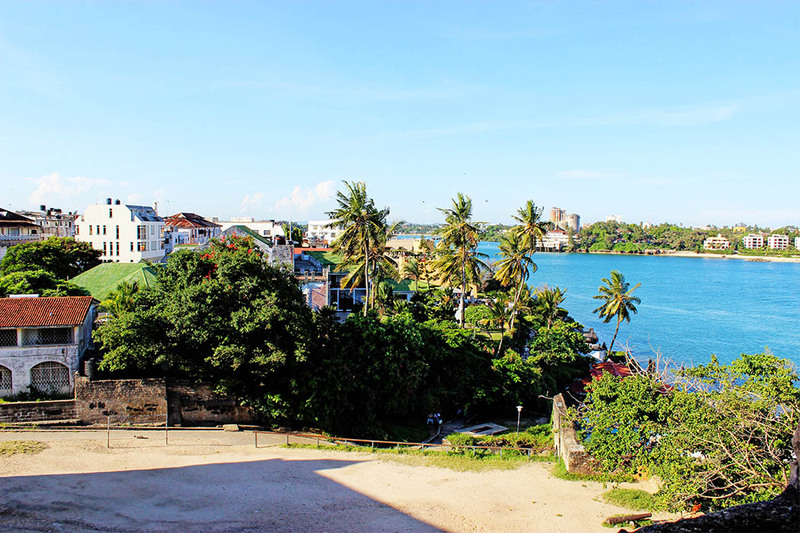 On 16 May the Sultan abandoned the fort, left Mombasa and became a pirate. 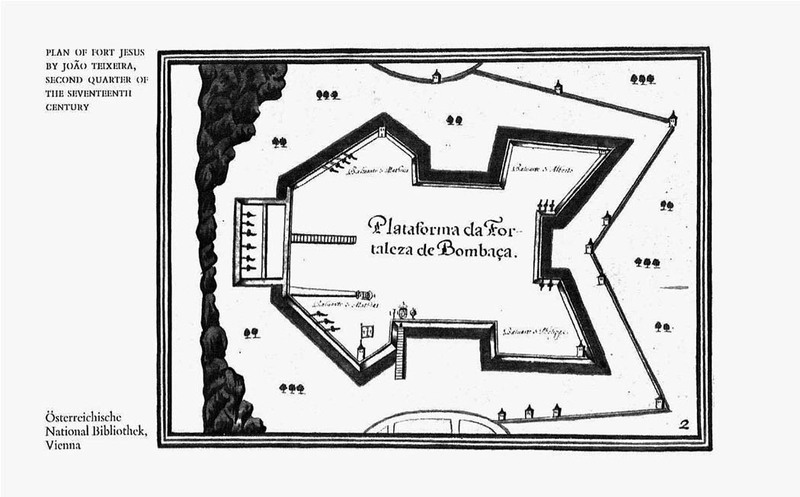 On 5 August 1632 a small Portuguese force under the captain Pedro Rodrigues Botelho reoccupied the fort. Once again from 13 March 1696 the fort was under siege. After a siege of two years and nine months the Omani Arabs took the fort. The Portuguese garrison had been reduced to nine soldiers as many had died due to disease. 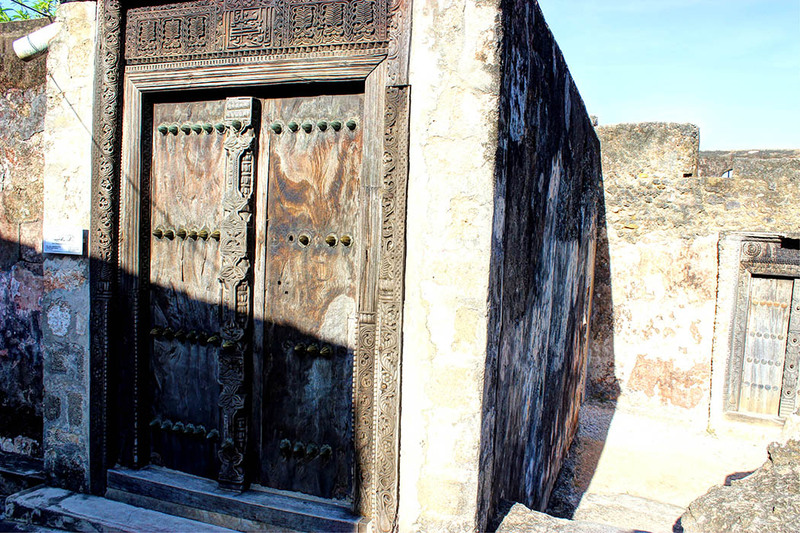 On the morning of 13 December 1698 the Omani Arabs attacked and took the fort, just seven days later a Portuguese relief fleet arrived at Mombasa, but it was too late. 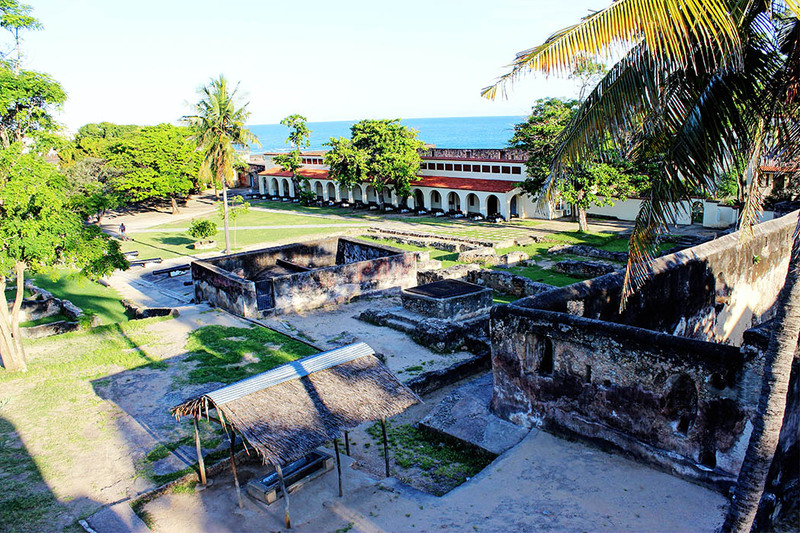 With the conquest of Fort Jesus the whole coast of Kenya and Tanzania with Zanzibar and Pemba fell to the Omani Arabs. 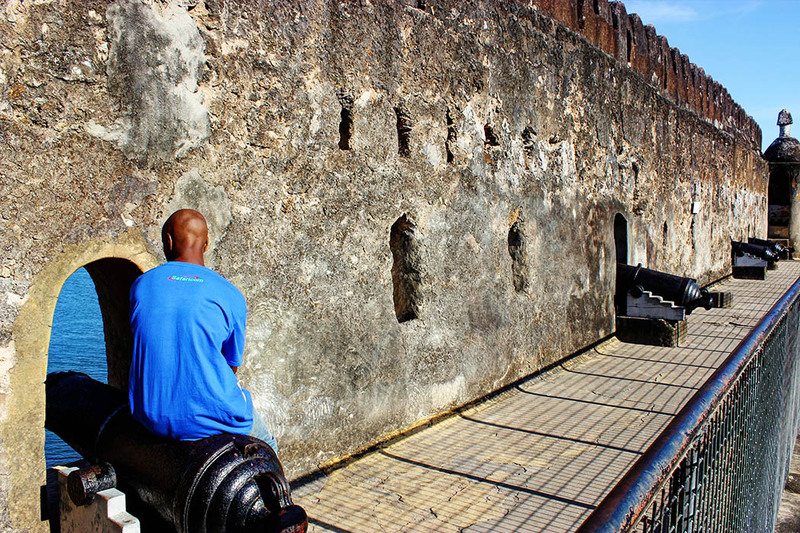 In 1728 the Portuguese retook the fort they were able to do so because the African soldiers in the fort mutinied against the Omanis. The Sultan of Pate offered to hand over the to the Portuguese on 16 March 1728,their re-occupation was brief and in April 1729, the people of Mombasa revolted against the Portuguese and put under siege the garrison that was forced to surrender on 26 November 1729. 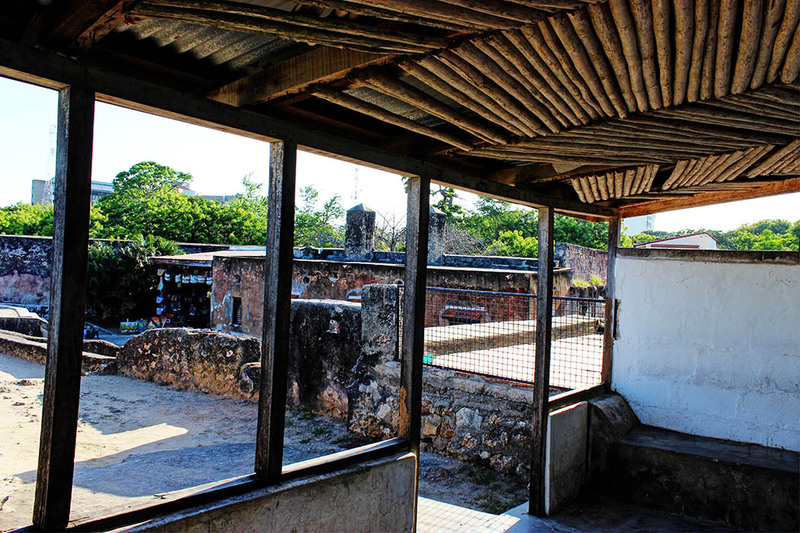 When British Protectorate was proclaimed on the 1st July 1895, and the fort was converted into a prison until 1958 when it was converted it into a historical monument. 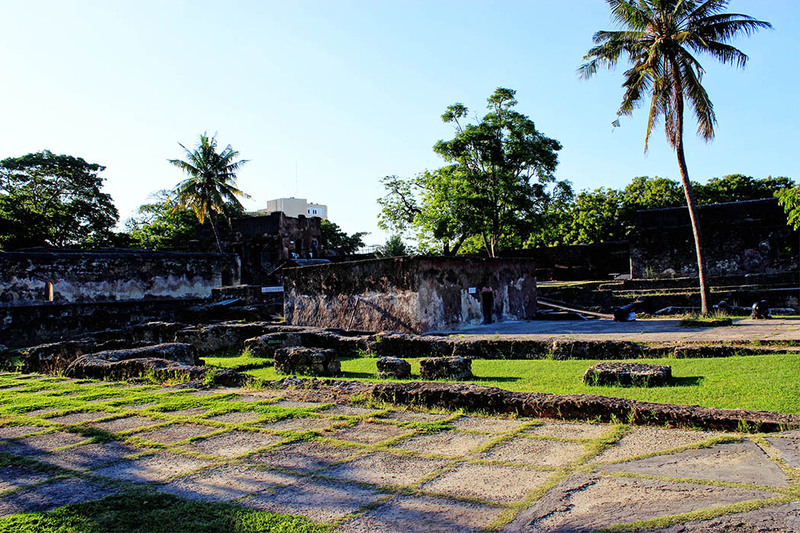 On the 24th October 1958 Fort Jesus was declared a National Park and on the 29th November 1960, it was officially opened to the public. On 1st January. 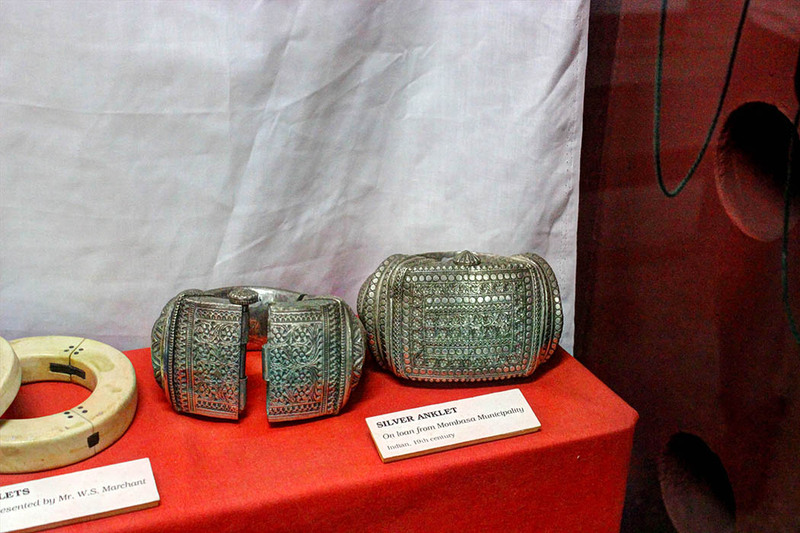 1969, it was transferred from the custody of the National Parks Trustees to the Museum Trustees of Kenya. 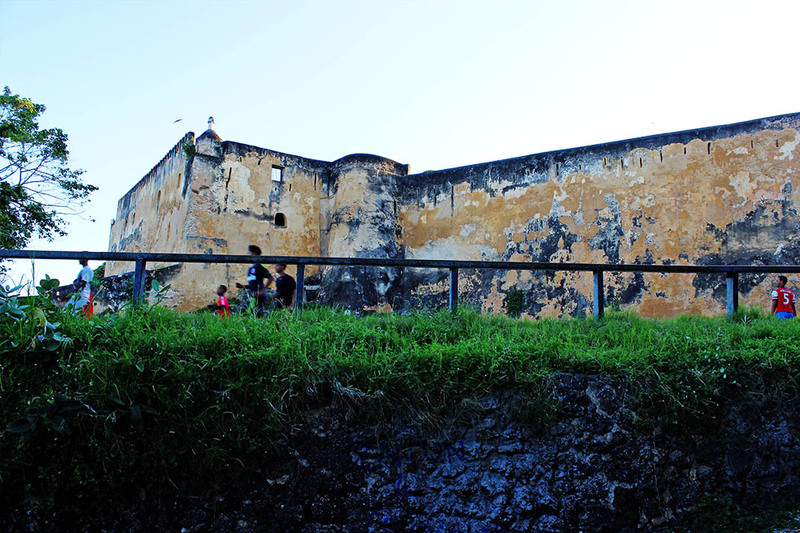 The fort was declared a World Heritage site by UNESCO in 2011. 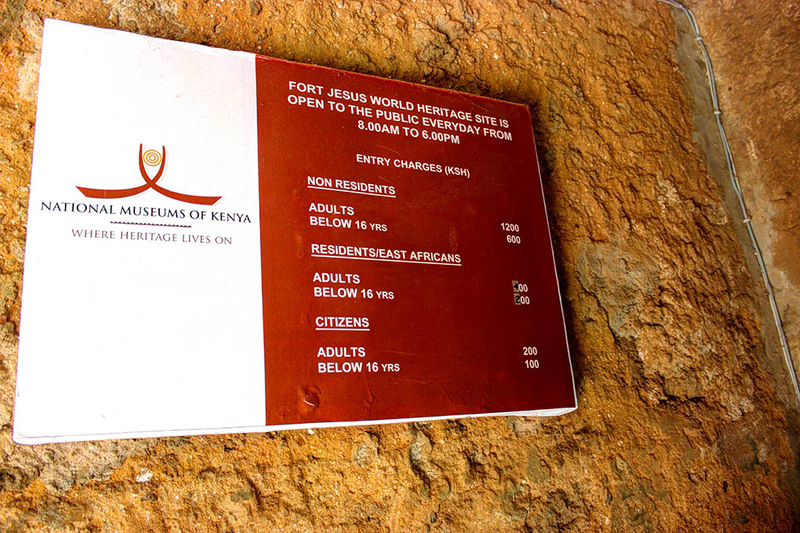 Today, the fort, which occupies an area of land about 2.5 hectares, is a major tourist attraction. 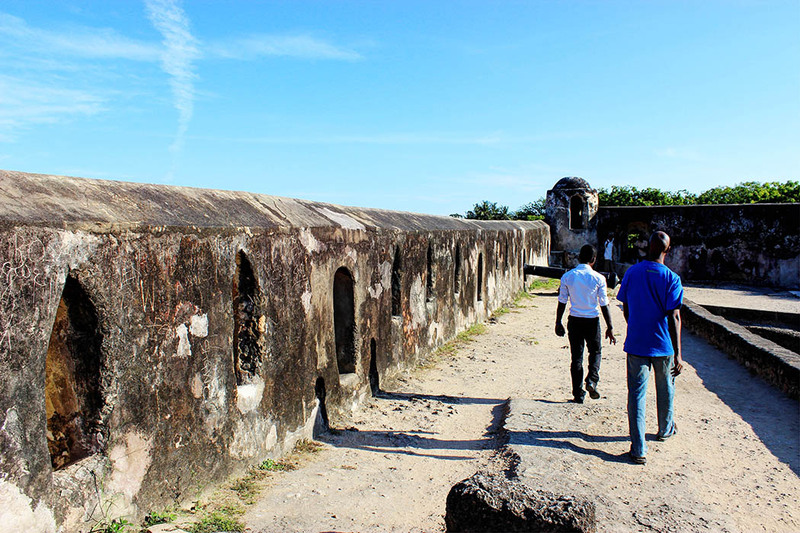 I visited the fort last year in December with my brother. We’d both been there before but this is the first time I have taken proper photos. 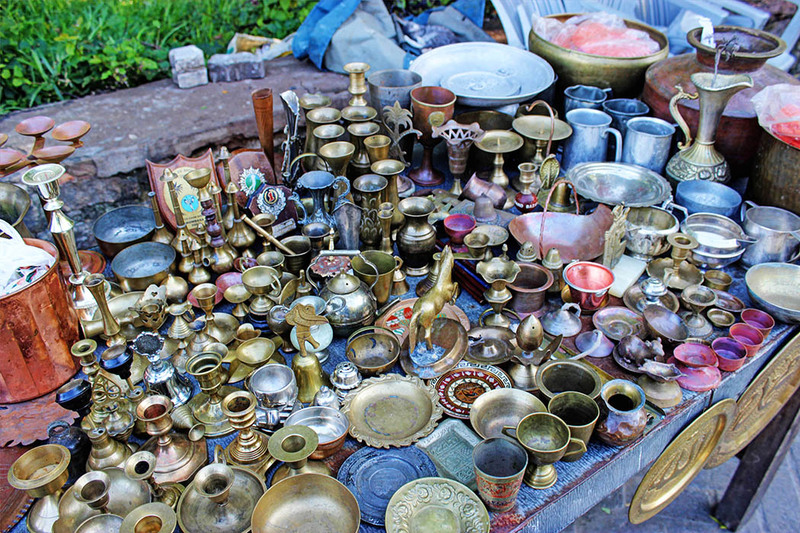 Right outside the fort there was an old man selling brass antiques. I love little trinkets so I had to stop and take a photo. We got to the fort and opted for a guided tour. Guided tours are free, you can choose to tip your guide if you enjoy the tour. It was almost closing time so we took a quick tour of the fort. If my memory serves me right the door is just for decoration, it does not lead anywhere it was a gift from the Sultan of Oman. 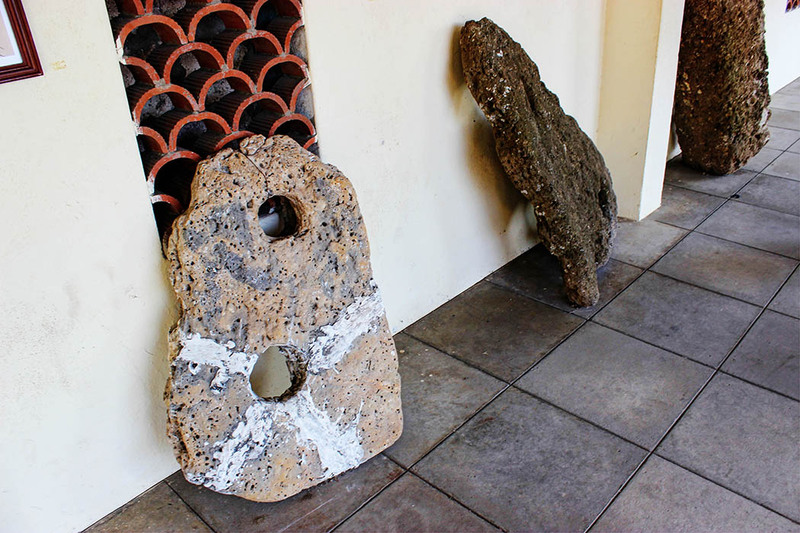 The entire fort was built out of large hewn coral blocks measuring roughly 13 inches by 89 inches. The walls were made of plastered earth and sometimes rubble. 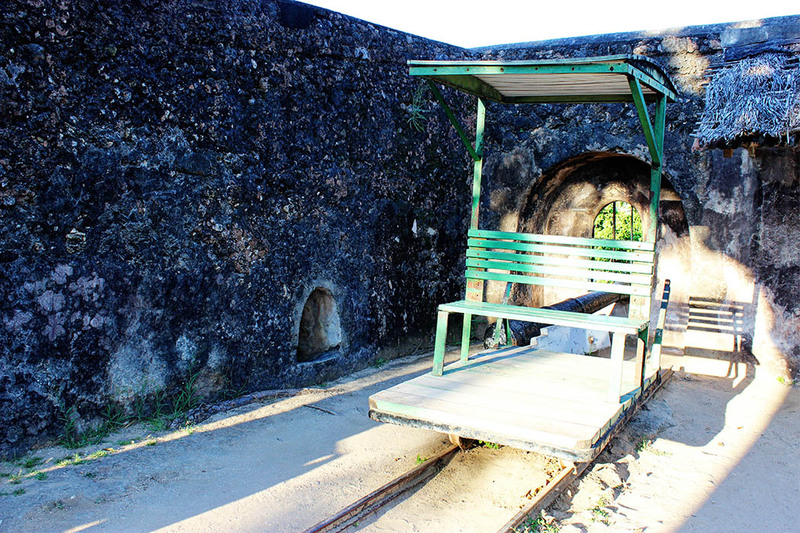 Remnants of the trolley system used for transport in Mombasa. 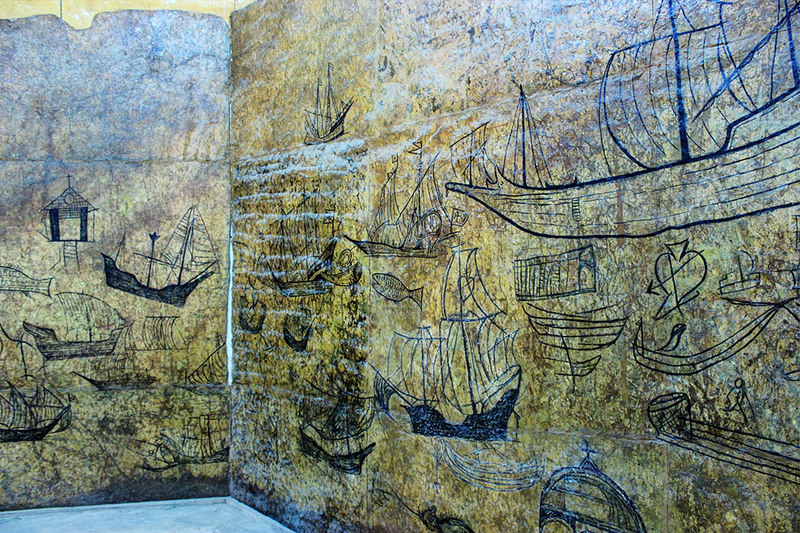 One of the rooms contains a panel of Portuguese paintings. There was not much to do in the Fort and painting was one of the ways the soldiers kept themselves occupied. The Captain’s house was built overlooking the harbor. 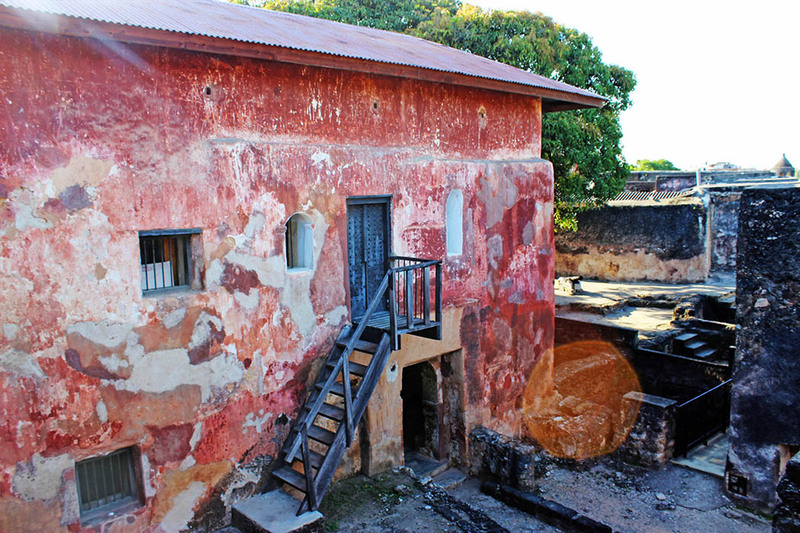 Parts of the house were destroyed during the Arab siege of 1696-8, and were never restored. 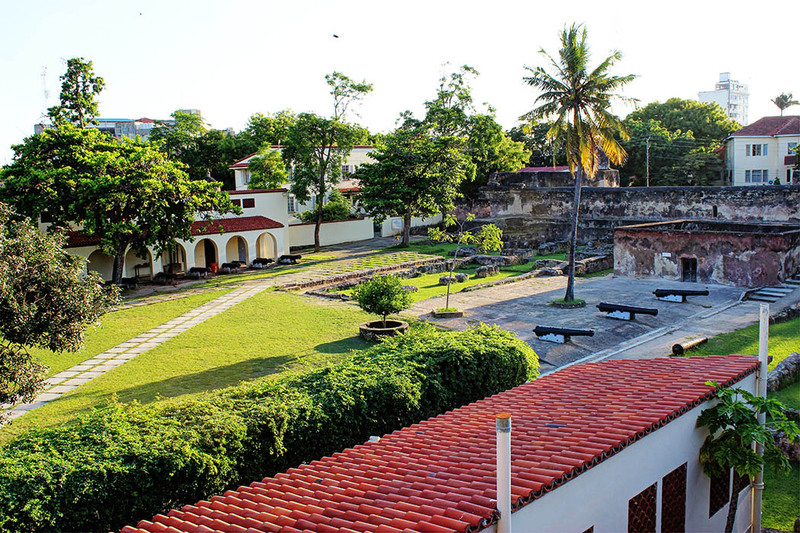 The contemporary layout the main, central courtyard of the fort incorporates new structures built during the restoration include a museum, the former curator’s house (now the site offices), a ticket office, toilets, a refreshment room, and a shop. 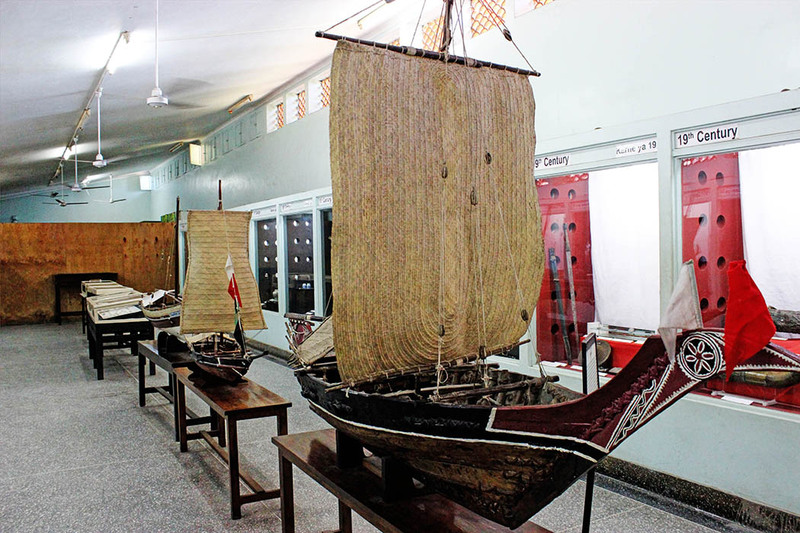 Within the fort museum, displayed artefacts link the story of the Portuguese presence on the East African coast to the larger history of the region: the collection includes ceramics of Chinese, Persian, Arab and Portuguese origin, as well as a collection of East African earthenware, weaponry, and instruments. 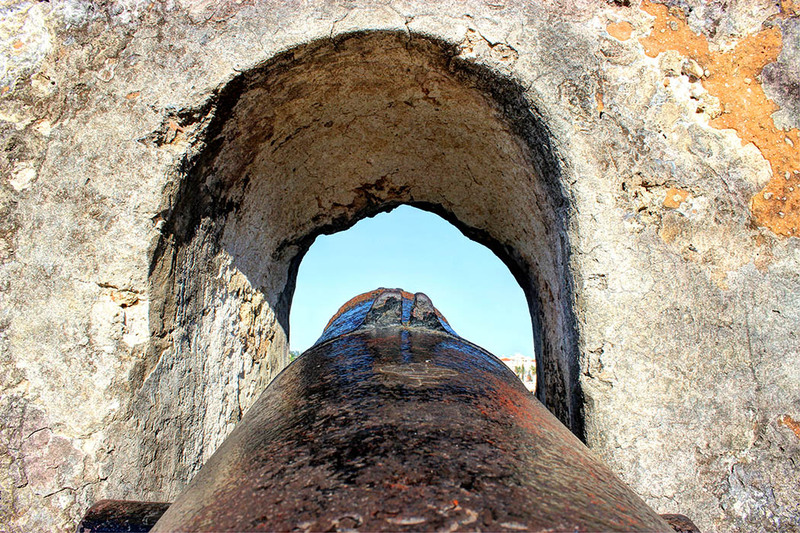 Housed outside Fort Jesus is a cannon from HMS Pegasus a 2000 ton British cruiser. HMS Pegasus an elderly 2000 ton Third Class cruiser was sunk on the afternoon of 20 September 1914 off Zanzibar harbour by the 3000 ton German cruiser SMS Königsberg. 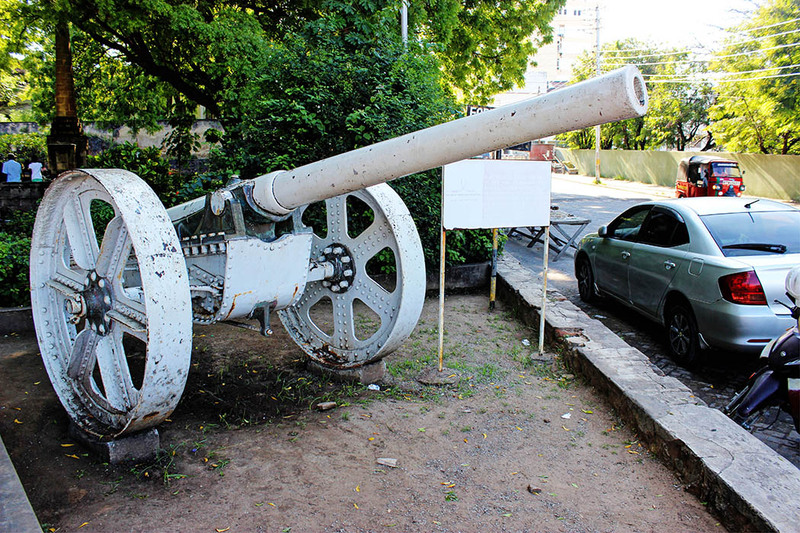 A floating crane was used to retrieve the eight 4 inch guns and after a short period of reuse one was presented to the town of Mombasa. Fascinating history and lovely shots. Holy smoke! That is a lot of history. I would love to take that tour, it must so strategically placed for so many people to have wanted it :-). Someday, l will experience all these places you write about!!! 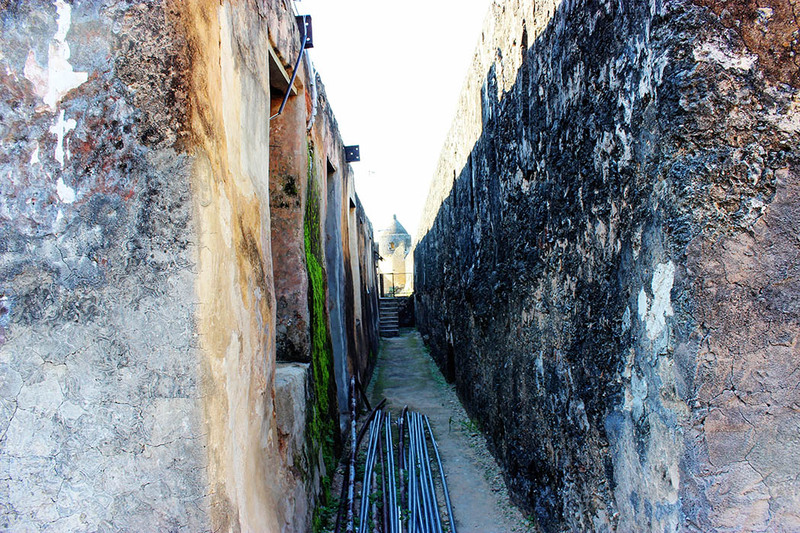 Great pictures as usual..
Amazing photos and a very interesting history of this fort. Rachel, I have never heard of Fort Jesus before, but now I really want to go. I love your photos. Yay #wkendtravelinspiration! The mark so many European countries left on so many disparate parts of the world, is the forts they built. This one looks well preserved and nice they give guided tours. This looks like a really interesting place to visit. That room with all the boats painted on it really caught my eye. All your photos are beautiful. The rounded edging at the top reminds me a bit of a fort I was in in Morocco, but it’s not the one you mentioned. Wow, this place’s so historical and mysterious! I absolutely loooooove it! Added to my bucket list :-).